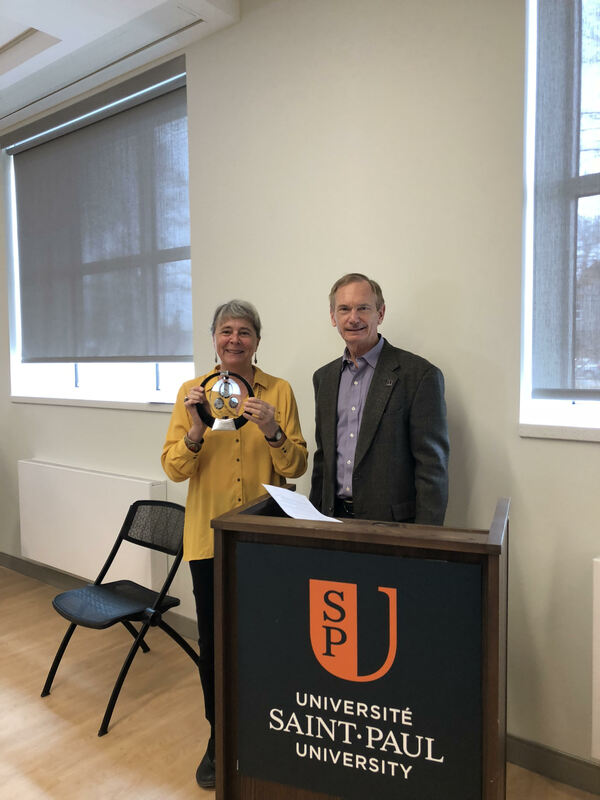 At a general meeting held on 10 April 2018, the Professors’ Association of Saint Paul University paid tribute to two of its members, Terry Lynn Gall and Susan Roll. a) In recognition of her twenty years of service as treasurer, the President gave an engraved clock to Terry Lynn Gall. In addition, Terry served the Association as the member of the Board of Directors for twenty years and member of the negotiating team for the collective agreements of 2009, 2012, 2015, and eventually for 2018. Terry offered a response with her own memories, and the membership, in turn, gave her a standing ovation. b) In the absence of Susan Roll, the Association unanimously voted in favour of the following resolution. Whereas Susan Roll served the Association for seven years in various positions, including Secretary, member of the negotiating team, President, and Chief Negotiator. Whereas Susan announced her retirement as of July 1, 2018. Be it resolved: That the Professors’ Association acknowledges its gratitude for the contributions of Susan Roll and wishes her well in retirement. Be it further resolved: That Susan Roll be admitted as a lifetime Associate Member of the Professors’ Association commencing on July 1, 2018.